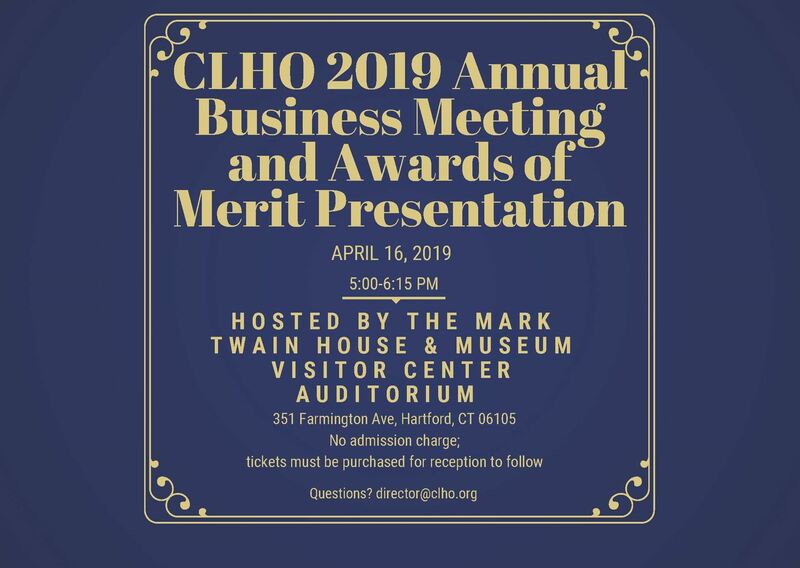 CLHO's Annual Business Meeting & Awards of Merit Reception will take place on Tuesday, April 16, 2019 on the campuses of the Harriet Beecher Stowe Center and the Mark Twain House in Hartford, CT. Per CLHO's Bylaws, the Annual Business Meeting must be held between March 1st and June 7th each year. For a long time it has been included in the Annual Conference, which is held in early June. Beginning in 2019, CLHO will be holding the Annual Business Meeting, along with the Awards of Merit recognition ceremony, as a separate event in April. The Board of Directors of the Connecticut League of History Organizations proposes seven amendments to the Bylaws. The amendments will be considered by the general membership at the 2019 Annual Business Meeting. Amendments require favorable approval by a majority of members present. Changes are effective immediately. A full version of the current Bylaws is available HERE. Proposed Amendments to the CLHO Bylaws can be viewed HERE. The 2018 Annual Business Meeting Minutes can be viewed for download HERE.